In the U.S. today, 10 million individuals already have osteoporosis and 34 million more have low bone mass, placing them at increased risk for this disease. Cod liver oil is a true superfood with an expansive list of health benefits. Women over age 45 experience more annual hospitalization days associated with osteoporosis (loss of bone density) than with diabetes mellitus, heart attack, and breast cancer. By 2020, half of all Americans over the age of 50 are expected to have low bone density or osteoporosis. For those 50 or older patients who get a hip fracture, almost one in four die in the year following their fractures! Six months after a hip fracture, only 15% of patients can walk unaided across a room. The truth is that osteoporosis is a major public health threat. In fact, in the U.S. today, 10 million individuals already have osteoporosis and 34 million more have low bone mass, placing them at increased risk for this disease. One of the simplest methods to prevent osteoporosis is to get an adequate amount of vitamin D. Vitamin D, or “the sunshine vitamin,” is a major regulator of intestinal absorption of calcium. Without an adequate amount of vitamin D in the body, calcium will not get absorbed. In other words, calcium and vitamin D work hand-in-hand to build strong bones. A study in the Journal of the American Medical Association found that healthy bones could be maintained with calcium intake of less than 800 mg a day, as long as there was sufficient vitamin D intake. However, without sufficient vitamin D levels, healthy bones could not be maintained, even with calcium intake of over 1,200 mg a day. Cod liver oil is a true superfood with an expansive list of health benefits, including protection from bone loss. The major reason why cod liver oil benefits the bones is that it is rich in a variety of important nutrients. While many people are aware of the omega-3 fatty acid content (which can also protect bone health), it is not so readily known that cod liver oil is also an excellent source of vitamin D. In fact, cod liver oil has higher concentrations of vitamin D than any other food source! One teaspoon of high vitamin cod liver oil contains approximately 1400 to 2000 IU of vitamin D. To put that in perspective, the typical dose of vitamin D in a multivitamin supplement is around 400 IU, the recommended daily allowance. And generally, a minimum dose between 600 to 800 IU per day is recommended to prevent osteoporosis. On top of the many cod liver oil benefits, the best news is that it is very inexpensive! For many people who are on tight budgets, cod liver oil is a low-cost and effective source of two critical, superstar nutrients – omega 3 fatty acids and Vitamin D. Typically, a 12 fluid ounce bottle through an online supplement provider will cost you less than $5.00 and will last you almost a month. How Do I Take Cod Liver Oil? Consume cod liver oil on a daily basis. A tablespoonful of cod liver oil will generally give you about 1400 to 2000 IU of Vitamin D along with 2800 mg of EPA and DHA, the best form of the hugely beneficial omega- 3 fatty acids. You can also mix it into your blended morning drink if you want. 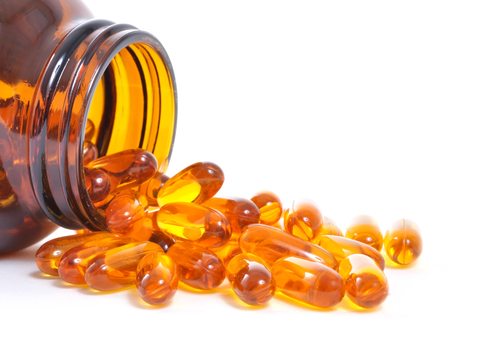 Be sure that you choose a cod liver oil supplement that has been tested for mercury. Mercury can damage your kidneys and cause a wide variety of other health problems. As long as your cod liver oil has been properly processed and purified, it should be low in mercury. Particularly, if your cod liver oil is marked “pharmaceutical grade” it should be safe. Children generally need only half the dose that adults take in order to experience all the cod liver oil benefits. However, the dosage varies depending on how concentrated the product is. So be sure to follow the recommendation on the label, especially in children. Be aware that you can overdose on vitamin D, but clinical evidence seems to indicate this happens rarely when the D comes from cod liver oil. Also, some scientist believe the natural vitamin A found in cod liver oil limits the effectiveness of the vitamin D. As long as you don’t take more than a tablespoon per day, these risks will remain insignificant and you can be assured of safely enjoying all of the cod liver oil benefits. Preventing osteoporosis is quite possible through natural healing modalities, but it can involve a number of proactive steps in combination with each other. Our Comprehensive Guide gives you details on supplement doses and other specifics you will need to know to effectively implement all of these important steps – all in one place. The National Institute of Health. This story was originally published in 2015 and has been updated. bone, bone density, bone health, bone loss, bone mass, breast cancer, calcium, cancer, children, cod liver oil, cod liver oil benefits, diabetes, diabetes mellitus, food, health, health problems, healthy bones, heart attack, heart disease, heart disease cancer, hip fracture, low bone density, low bone mass, mercury, national osteoporosis, national osteoporosis foundation, natural healing, natural healing modalities, natural vitamin, nutrients, omega 3, omega 3 fatty acids, osteoporosis, osteoporosis foundation, osteoporosis is, prevent osteoporosis, strong bones, sunshine vitamin, supplement, the sunshine vitamin, vitamin, vitamin a, vitamin d, your bones. Where are the top 10 foods not to eat for osteoporosis?